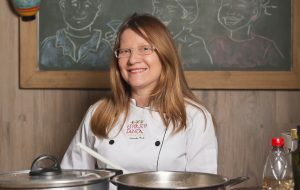 RIO DE JANEIRO, BRAZIL – On Thursday, November 10th, renowned chef, Natacha Fink, will be participating in the event Morar Mais por Menos (Cook More for Less), a part of the larger project in its 13th edition of Live More for Less that aims to teach people about sustainability and economical living. Chef Natacha Fink will give a cooking class Nov 11th in Rio de Janeiro, photo by Morar Mais por Menos. Natacha Fink is the chef at Espirito Santa, a Brazilian restaurant in the bohemian neighborhood Santa Teresa in Rio de Janeiro. The restaurant is famed for its indigenous themes, eye-catching interior and food that uses natural and fresh ingredients. In this edition of Cook More for Less, Natacha Fink will give classes in food preparation to create meals that are not only tasty, but economical and sustainable too. She will use fresh, sustainable and locally sourced ingredients and show that eating well for personal well-being whilst considering the wider environment is possible. The chef will cook up three meals that are exclusive for this event which the audience can try after the cooking class. On the menu is Ceviche da Roça which is a fresh, light meal made with sliced mushrooms, pineapple, red onion and classic tiger milk. There is also Selaron, a white fish tartare placed on top of a spicy slice of melon with ginger oil. Finally, the Moqueca da Feira uses ingredients easily sourced from local farmer’s markets with a combination of brocoli, cauliflower and earth banana. The event of Live More for Less will take place on Thursday, November 10th between 12PM and 9PM, and the actual cooking class will start at 4PM. It will take place at a venue in Lagoa.